Well the scanner seems to be working quite nicely, although the Hazard Knowles plane pic was too big to upload so I had to compress it to fit. Nice handle it matches the bench top. This was in the collection of Ray Wilson in Indianapolis and I shot this slide in 1979. I was invited to an invitation only tool show in northern Indiana in 1978 and shot the following two slides. The first one is a group of small planes, I think they are luthier planes as the following slide shows other tools. They are exhibited on a 12 inch square marquetry floor tile and there are over two dozen planes. 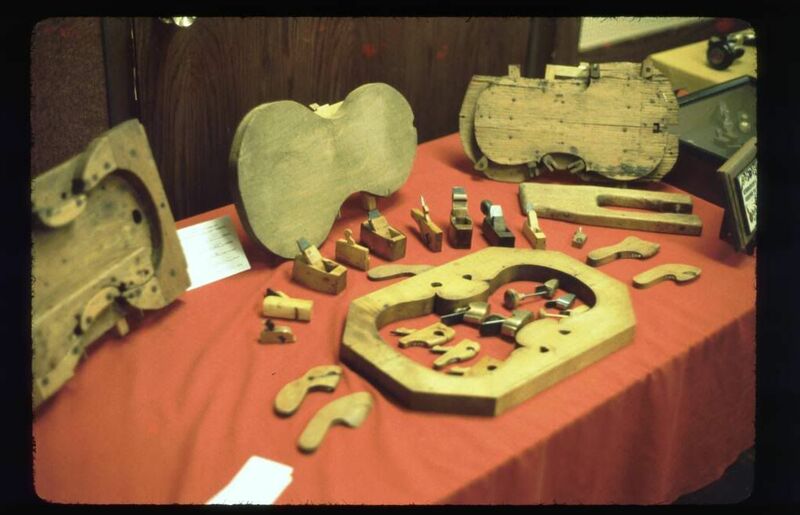 These are tools and forms used by a musical instrument maker. (Ken, I think I have mentioned these photographs to you before). At this show I was taken into a back room and shown a couple of illegal trip guns, one was disguised as a window sash lock. I wasn’t allowed to take pictures of those. Yes, I seem to remember the photos, but always nice to see again. I really like my little planes — they just work so well. 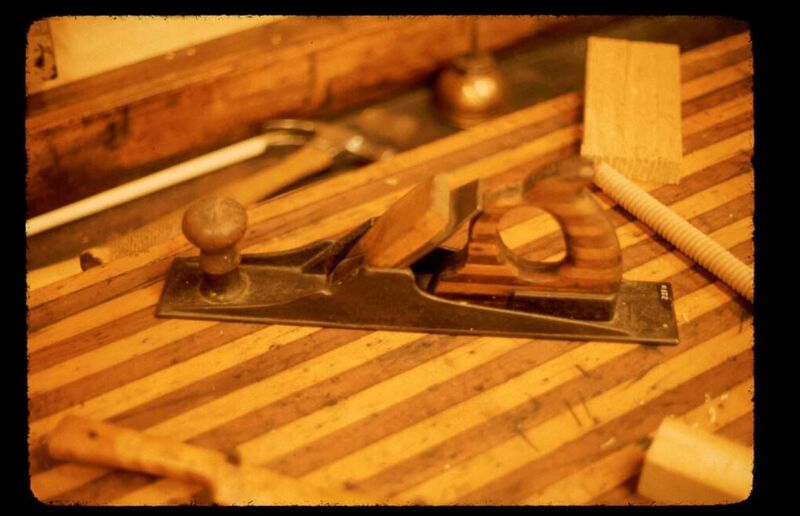 Was also introduced to a scrub plane at the last workshop. Great for rough arching the plates. Have to track one down now. The forms are interesting to. Traditionally, inside forms were used. 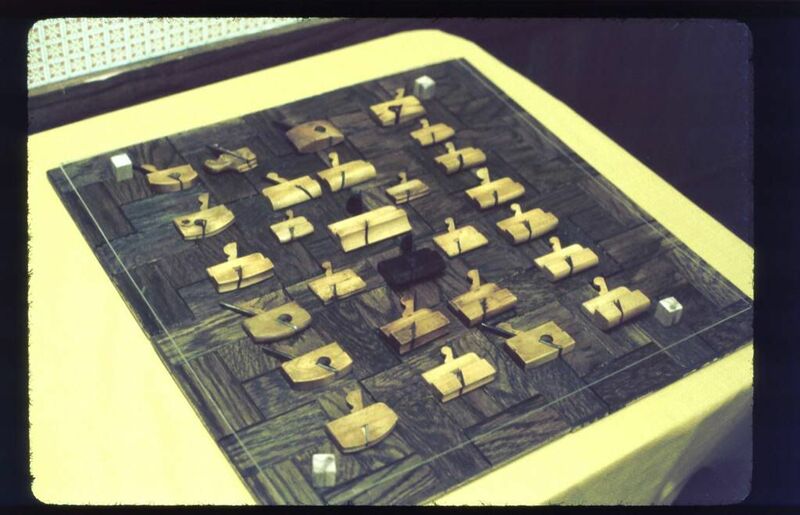 In the last photo, there appears to be an outside form flat on the table, and possibly an inside form leaning up on the right. The two leaning left and center appear to be some sort of carving cradles, though I far from certain about the one on the right. The forked object on the right appears to be some sort of handmade caliper for gauging plate thickness. The planes in the 2nd photo, on the floor tile, look more like moulding planes to me. Perhaps a piano maker’s?